Well, his characters at least. LIAM NEESON IS a certified badass. To illustrate this, eOne Movies created a map to provide a handy rundown of all the countries and the number killed, just in case you were wondering like. There’s even a method key, for a more detailed insight into his characters’ murderous ways. Reddit are nitpicking away at the details and potential inaccuracies, if that’s your thing. Taken seems to hold his biggest death spree, with a total of 31 kills. He wasn’t joking when he said he’d find them AND KILL THEM. We can’t help but notice that he hasn’t killed in his homeland yet. Watch your backs lads, he could be going for the full whammy. Email “Essential map shows every country where Liam Neeson has killed someone”. 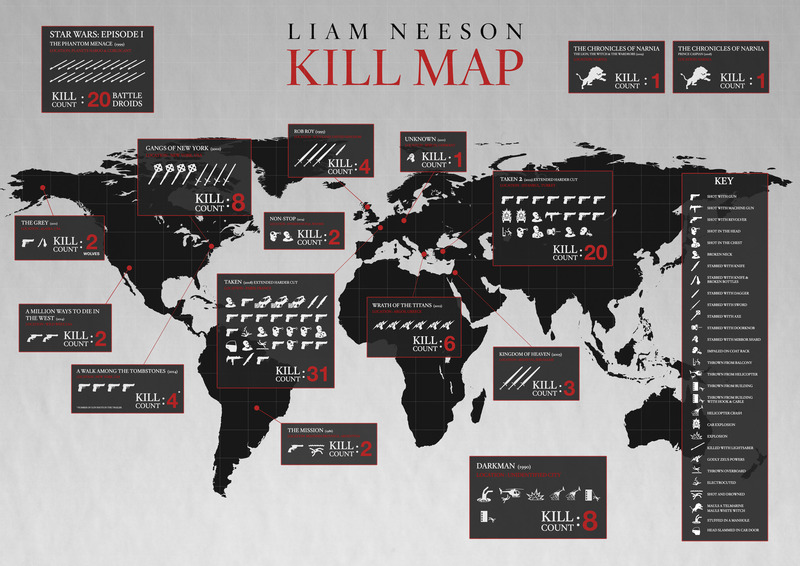 Feedback on “Essential map shows every country where Liam Neeson has killed someone”.